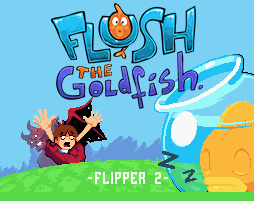 With Flipper 2: Flush the Goldfish out now in Europe, we got in touch with the game's developer Hugo Smits to find out a little bit more about the game and his plans for the future. Nintendo Life: Flipper 2 is quite a departure from the visual and gameplay style of the original Flipper. Why the decision to do something completely different for the sequel? Hugo Smits: I was asked by the publisher of Flipper to make a more traditional sequel, with some more levels and world themes. But that just didn’t sit right with me. One of the cool benefits you have from working on your own is that you can do whatever you feel like. I grew up with all kind of games. I played a lot of Earthworm Jim, Turtles, Mortal Kombat, Doom and Need for Speed 2. I really want to explore a lot of different genres and do something really fresh each time! 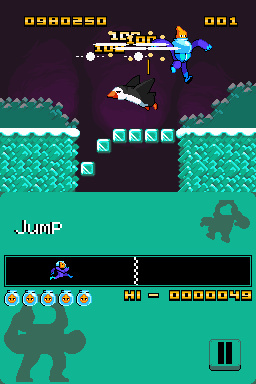 NL: One Button Bob is obviously a heavy influence in Flipper 2. Were any other games particularly influential when it came to developing the game. HS: The funny thing is, One Button Bob didn’t really have such a big influence as you might think. I took the gameplay concept. Because it was a perfect fit for handheld gaming. You can have a complete platform experience in short burst, yet you can play the game with only one hand! After that it was really my youth that influenced me during this game’s development. The same week that Flipper 1 got released in Europe, Earthworm Jim also appeared in the shop, I bought it and I totally loved it again. Such a weird and awesome game! For my birthday I got an old Playstation with Skullmonkeys which brought back all kind of memories too. Doug TenNapel’s crazy characters really influenced me big time. NL: Can you tell us a little bit about the actual gameplay? HS: Gameplay-wise it’s a lot like One Button Bob or Wario Ware. Flush starts at the left side of the screen and needs to get to the right side. 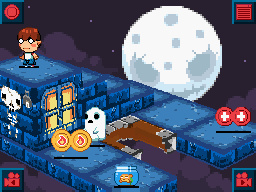 In between are traps and enemies and it’s up to the player to guide Flush through them. 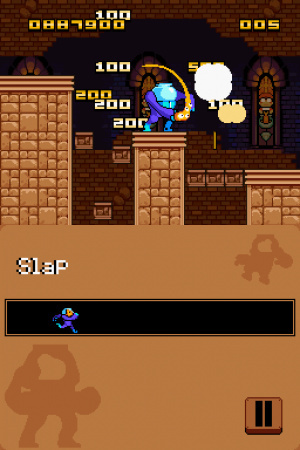 In every screen or room Flush can perform a different action, so you quickly have to figure out what the action is, and how you can use it to avoid the traps and enemies. The actions themselves are awesome and weird: the robot suit can actually grab Flush out of the bowl and hit an enemy with it. 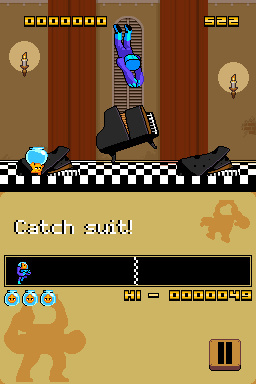 Or instead of ducking normal, Flush eats the suit. 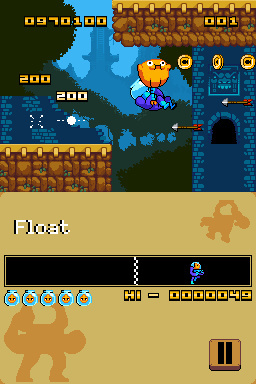 There are two modes; story mode and random castle mode. Story mode is more like a tutorial mode and starts off easy and slowly gets harder. The random castle mode is where the real game is at. You can select a difficulty and theme and than the game randomly generates a castle out of 300+ rooms. The castles feature around 10 minutes of gameplay, so they're great for short bursts of handheld gaming. Because there are so many actions and rooms AND because you can play all the rooms in all the themes it will make you come back again and again to play. NL: How different was it developing Flush the Goldfish as opposed to what you faced creating the original Flipper release? Any aspects of development prove particularly tricky? HS: Well, Flipper 1 featured a realtime 3D voxel engine that basically ate all the RAM memory. So I thought it would be a piece of cake this time with only some 2D graphics. However, because I really wanted some cartoon like animations in there we ended up with a lot of frames. Flush alone has more than 200 frames of animation! In the end the frames ate more RAM than the voxel engine, so I had to write a custom compression method to get everything in there [laughs]. But the end result is awesome... even dying is fun now because of all the different death animations! NL: The game features a lot of quirky humour. 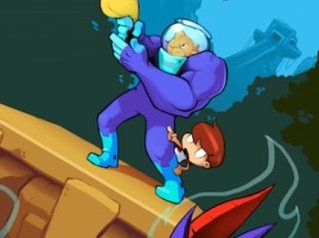 Did you make a concerted effort this time to give the game a funnier edge? HS: I really tried to make something funny and weird. There are just so many realistic games out there that don’t have a creative edge anymore (space marines are everywhere!) and I wanted to put the video games back into video game, when it was okay to use colour and do ridiculous things. I’m pretty sure you will see Flush do things you never expected or have ever seen in a video game — this game will surprise you! NL: Rumor has it that the game will feature a level editor. Is there any truth to this, and why the decision to include one if so? HS: Totally true! Some people where complaining about the duration of Flipper 1. I really wanted to make them happy this time around, so I included 300+ rooms (which should last you quite a while). I still remember calling up Ivo (the publisher) on the day we wanted to send the game to lotcheck and telling him I could do an in-game level editor. He must have really loved me at the moment, for suddenly delaying the game like that! I convinced him that I could do it over the weekend. Besides that (and this is really cool about him) he knew it was the right thing to do for the game so he allowed it. It took a bit longer than the weekend, but I’m really happy with it in the end result. Because it basically gives you the same options I had when creating levels in the windows Level editor. It works really easy and simple too. NL: Will there be a way for players to share their own level creations with other players? HS: No and yes. It’s not possible to share levels through SD card or code. It’s not like I didn’t want this, but it would be really difficult to get it through lotcheck. I’m working on a really cool way to share levels, but I can’t say anything about it right now, other than that it will be awesome. NL: When can we expect to see Flipper 2 released on DSiWare and has a price been decided on? HS: Very soon! I said that before, but I really mean it this time.. Europe can play it right now, and North America will follow soon after (no official date yet). Nintendo didn’t officially approve it yet, but the game will probably cost 500 Nintendo Points! NL: What are your thoughts on Nintendo 3DS and do you have any plans to bring the Flipper series to the system? HS: My studio, Goodbye Galaxy Games, is an approved Nintendo 3DS developer. So it’s only a matter of time before the first title hits the eShop. I can’t wait to write some code for it; it’s going to be so exciding to see what cool things I can do with the hardware, I’m really looking forward to just locking myself in a room for a week with a devkit and creating all kinds of little prototypes. We'd like to thank Hugo for taking time out of his busy schedule to take part in this interview. Dying is very fun, I agree. oops, I thought who made the Mario galaxy games are now making a flipper game LOL! Can't wait for this (and the other game he teased) to come to NA! DAY ONE, Hugo, day one. You really had me worried here for some seconds, guys. At first i only read the blue text on the main page and thought Hugo had to give up on developing. What a shocker that was. I like the art direction of the games a lot. Huge props for that. I didn't invest much time in Flipper because it allowed for too much freedom in bombing and thus i ended up a bit frustrated. I have to give that game another shot some day. Flipper 2 sounds really great and i have no doubt that the review will have nothing but good words about it. After that i will most likely buy it. I think I don't buy this game because I never download DSi Ware. Only Virtual Console. Old Skool rules!!! I hope one of the next games he's working on is that FPS he hinted at in one of the forums. @Galaxia-Master Flipper 2 isn't oldskool enough for you ? @brandonbwii I'm currently working on a 200 point DSiWare game, after that I will start to really work on the FPS and it's going to be for 3DSWare. "I played a lot of Earthworm Jim"
Well, that really explains a lot of things, like the main character and the quirky humour. It does sound like you were having fun, and it is nice to hear it has a level editor too! I'll be on the lookout for this one, best of luck, Hugo! Nice interview! I got Flipper on Day 1 so I look forward to the sequel to go along with my month old 3DS. So, Hugo, how soon until you start to HEAVILY hint on the DSiware release? So far, I'm loving the price point! I loved Earthworm Jim on our SNES back in the day. I'd love to get this! Come to NA soon! Well, I wait for a review, maybe I download it. But I want to play out my other games first and play Links Awakening. But you guys let see that Dutch people CAN make good games. @HugoSmits, I loved the original Flipper and this new Flipper 2 looks beyond exciting and I plan on downloading it ASAP. 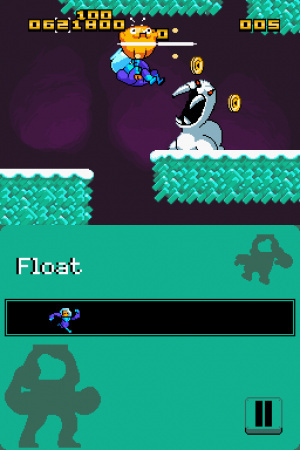 I can definitely see the Earthworm Jim influence and I'm really looking forward to seeing what you do with Flipper on the Nintendo 3DS.